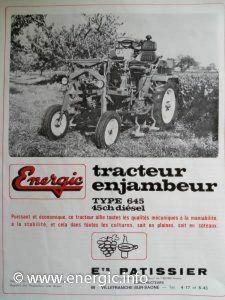 Energic Enjambeur type 645 45 cv diesel. Engine/Moteur. 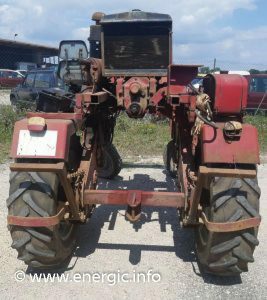 Indenor DP4,88, 4 cylinder, 4 stroke, vertical in line, (1960 cm3), diesel, 45cv @ 3000 rpm, 115.7 Nm at 1500rpm, alésage 80 x course 80mm, Injection direct, max., revs 2600rpm. Lubrication. 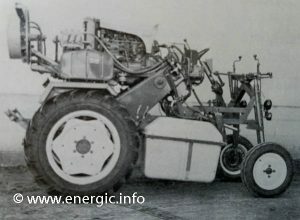 By constant circulation of oil held within the sump of the engine. The circulation by pumped pressure also from from crankcase compression. (Graissage par pompe incorporée). Cooling. Fan assisted liquid cooled radiator. Starting. 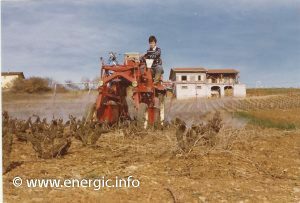 Electric starter, and full electric pack lights etc.Battery 12v 80 a/h. 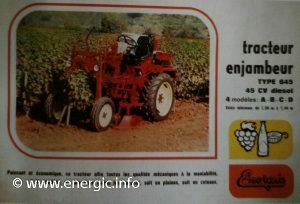 Energic Enjambeur 645 with pumped spray system 220 liters. Air filter/Cleaner. Metallic element – (dependent upon the element that can be oil surface coated), fuel filter. Gears. 4 speed forward and a reverse gear.. Differential blockable. By lever or automatic. Speeds in gears. 1st = 3.9 km/h, 2nd = 8.2 km/h, 3rd = 14.3 km/h, 4th = 21.3 km/h. Reverse 1st = 4.3 km/h. With wheels diameter 11 x 28. Clutch. 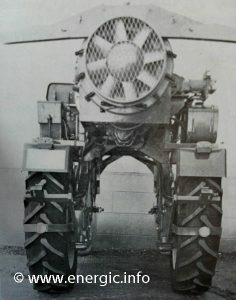 1 disc dry, command hydraulic. PTO. Multi disc, at 540/3000 independent and proportional. Normal 1 3/8 inch spline. Exhaust/Silencer. Fitted in a frontal left position, away from the driver. Seat with suspension. Wheels. Pneumatic Tyre wheels front 550 x 16 and 10 x 28 Rear (option at extra cost 11 x 28,). Blockage independent for each wheel. Turning circle 2.4m. You can add water to the rear tyres to increase the weight for extra traction. Brakes. On each rear wheel enclosed disc type, pressure by manual foot pedals, independent that can be linked. + hand brake. Hitch. 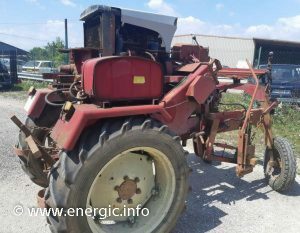 3 point hydraulic lift control automatic. universal hitch for towing implements. + 4 plugs ancillary hydraulic. Instrument binnacle. 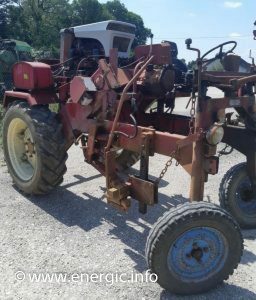 hours, revs, amp meter, temp., gauge etc. Fuel consumption. 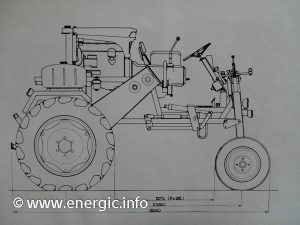 2.5 liters of fuel per hour dependent upon working conditions. the tank holds approx.28 liters. (Réservoir de carburant). Dimensions. 3.25m long, height max. 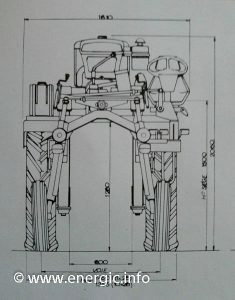 2.06m, height seat 1.5m, width 1.610m, width trac of tyres 1.45m. Optional equipment/adaptions. 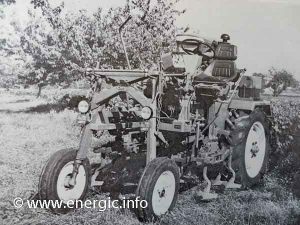 It could be fitted with a pumped spray system up to 400 liters. supplied in France.